2550 Peppertree Place Plover- Located in our 55 and better Peppertree Place Community. This upscale stand alone single family home completed done and move in ready! Open floor plan with custom kitchen (granite countertops and stainless appliances), great room with fireplace, sunroom, main floor master suite, main floor laundry room. Lower level features large e-gress windows, family room, 2nd bedroom, full 3rd bath and plenty of storage. 4265 Windsong Place Plover- Located in our Upscale Zero Lot Windsong Development- this is the last unit available and completes the development. 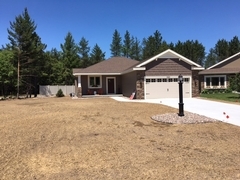 This home is also completed and move in ready. Open floor plan with custom kitchen (granite countertops and stainless appliances), great room with fireplace, main floor master suite, main floor laundry. Lower level is finished with a family room, 2nd bedroom, 3rd full bath and plenty of storage.